2014 was the year in which the Federal Reserve announced to end its quantitative easing (QE) stimulus program. As a result, it was the year of the dollar. The dollar rose relative to all currencies. The euro also declined heavily and now trades at only $1.19 as opposed to the $1.39 it traded for mid-2014. Many investments denominated in U.S. dollars correspondingly increased in value. U.S. stocks rose by 11.4% (S&P 500) this year and U.S. government bonds saw their best year since 2011. The interest rate on 30-year Treasury bonds declined from 3.93% to 2.75%. The drop in interest rates on Treasury bonds was striking. Every “expert” expected the interest rates on U.S. Treasuries to rise due to the economic recovery in the U.S. However, they fail to understand that “tapering” (or the anticipation of “tapering”) also leads to a stronger dollar. A strengthening U.S. dollar makes investments denominated in dollars more attractive to foreign investors. Fixed-income securities ? government bonds ? are a logical choice for many. This is what I call the “destabilizing” effect of floating exchange rates. An appreciating dollar increases the potential rate of return for foreign investors who, in turn, drive up the exchange rate of the U.S. dollar even further. This spiral does not end prematurely. There is no “feedback” mechanism to stabilize this speculation, while it can have major consequences for unrelated industries. This is one of the major failures of the post “Bretton Woods” era. Neither do these self-appointed experts understand that the economic “recovery” is fragile, and one that can, at any point in time, fail to meet expectations and fall back into a recession. This is also indicated by the lack of employment. The strengthening of the dollar may be premature. No “tapering” ? a balance sheet contraction? has yet taken place. The growth of the Fed balance sheet is slowing down somewhat though. 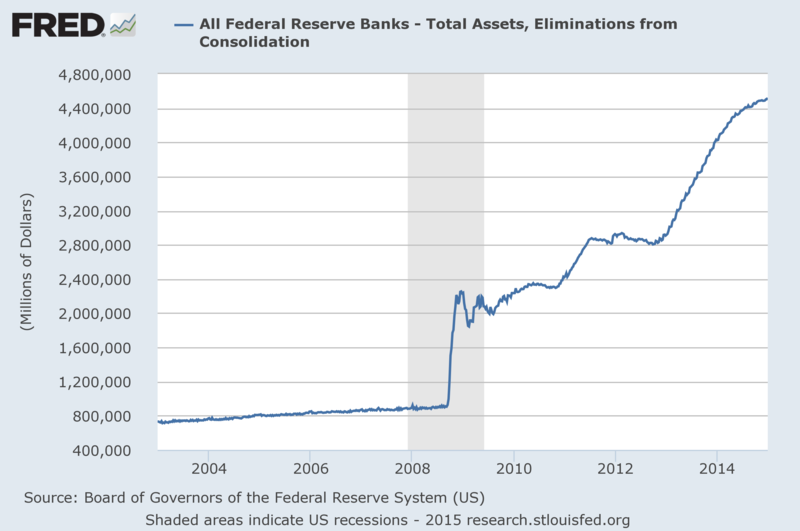 But we should remember that the total assets of the Federal Reserve currently amount to 27.7% of GDP. “Tapering” only takes place when the Fed balance sheet is actually contracting. Of course, the market cares little about what “is happening” right now; it is always looking forward. The market always looks at the present value of future cash-flows. In this case, the appreciation of the dollar can be explained by the “anticipation” of a tighter monetary policy by the Fed. The appreciation of the dollar also reflects the fact that the majority of market participants believes in the dogma of central bank omnipotence. They believe that the central bank can contract its balance sheet without creating upheaval in the financial markets and pushing over-indebted companies and households into bankruptcy. As a result of saving marginal debtors from bankruptcy by cheap (re)financing and 0% interest rates, the monetary expansion of the past years has worsened the underlying economic conditions, instead of improved. The monetary policy of the past years has mainly postponed bankruptcies (until interest rates or commodity prices rise, or until the Fed voluntarily raises interest rates), has boosted business valuations to absurd levels (and correspondingly, stock prices) and has pushed interest rates to historical lows on loans that are as risky as one could possibly imagine. A change of policy by the U.S. central bank can only produce unpleasant consequences. My expectations are therefore pretty clear. Fed chairwoman Janet Yellen will increase interest rates little by little. At a certain point though, the marginal costs of capital of the most vulnerable and indebted companies will increase to such an extent that a series of bankruptcies is possible. It will become clear the economic recovery is built a house of cards leaning on 0% interest rates and cheap corporate financing. Stock prices will collapse. Quickly thereafter the Federal Reserve will decide to resort once more to the only tool it has; 0% interest rates and printing money. Note that the U.S. monetary base is actually already declining, but this may be the result of transactions conducted by foreign central banks (who increase their dollar reserve at the Fed) or by the U.S. Treasury. Europe is more conservative than the United States. While the Fed tries to implement the misguided teachings of Keynes, the monetary policy of the ECB is heavily influenced by Germany. For example, Jens Weidmann ? chairman of the German Bundesbank ? in a recent speech, referred to the work of Jesús Huerta de Soto, a Spanish economist who adheres to Austrian School of economics. It seems that Jens Weidmann subscribes to the teaching of the “Austrians” instead of those of Keynes & co. After all, they stress the importance of structural reforms instead of the monetary magic bullet. 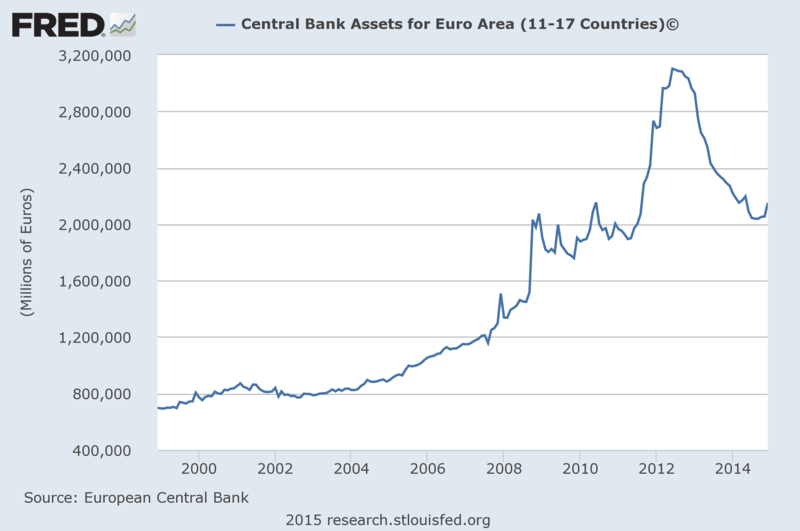 This is also reflected in the development of the ECB balance sheet. Since June 2012, the ECB has in effect been “tapering.” But even total assets of the ECB still amount to 16% of total Eurozone GDP. The (financial) papers are talking about the upcoming “stimulus program” of the ECB. The level of commotion increased this week. Due to dropping oil prices and temporary agricultural surpluses because of Europe’s sanctions against Russia, the ECB’s consumer’s price index (HICP) is close to zero. There is a fear of deflation. Apparently, some people think falling prices are disastrous. At the same time, Mario Draghi states at every press conference that the ECB is prepared to do whatever it takes. This has been a bluff; mere rhetoric. Draghi is like Santa Claus promising to overload you with presents, without ever giving them. In reality, the ECB is doing little and ? I expect ? it will continue to do little this year. Not only because there are few creditworthy options left, but also because buying government bonds is risky for political reasons. An example: last week there were rumors that the ECB is considering a €500 billion stimulus program. If these €500 billion are proportionally divided among the various Euro Area counties, this would mean that the ECB would buy €28 billion of Dutch government bonds. A gigantic sum. But that is not the end of the story. Many ECB members have already indicated that buying Greek government bonds is not an option due to its creditworthiness (or lack thereof). If that is the case, then the ECB would have to buy more bonds of other member countries, or only of those which have a Triple-A credit rating, which would present new problems to the ECB. 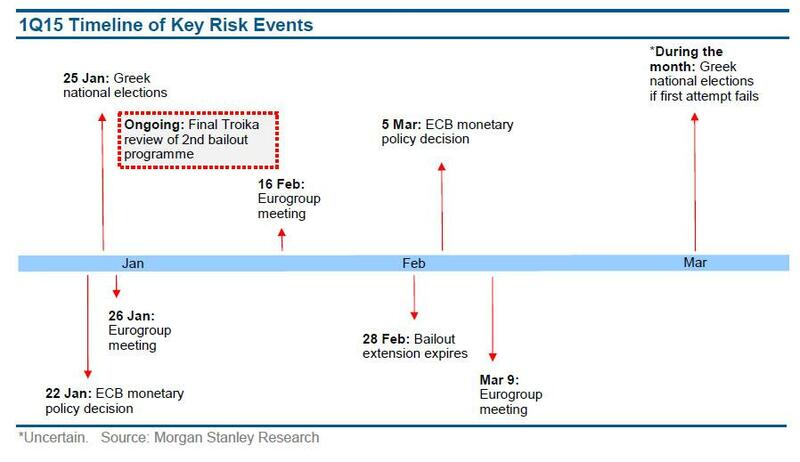 More news is expected on January 22nd, when the ECB announces what actions it will take. Three days later, elections take place in Greece. Can we truly expect the ECB to announce a stimulus program already on January 22nd? I expect few promises and lots of emphasis on the nature or falling prices in the Eurozone. We already saw the size of the central bank balance sheets in the U.S. and Europe relative to GDP. Looking at those numbers, we see why conditions in Japan are the most alarming. 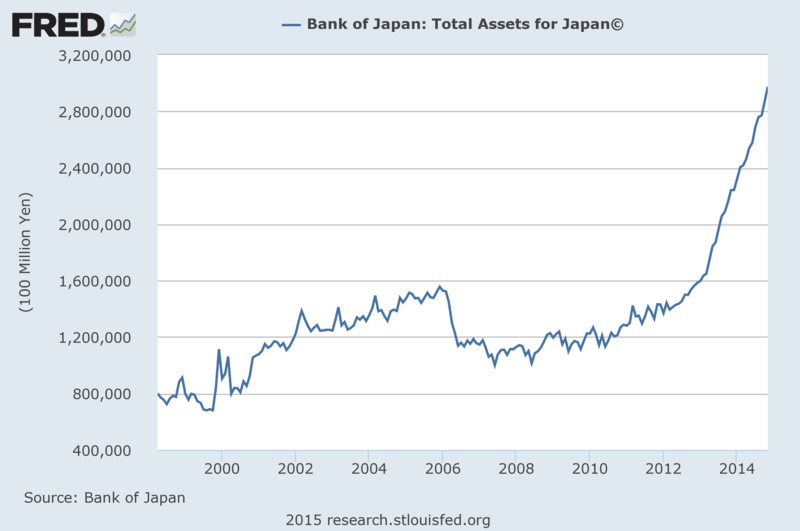 Total assets of the Japanese central bank amount to no less than 61.3% of the Japanese GDP. Japan has a zombie economy. The Bank of Japan (BOJ) is not an example of a bank that has done too little, but one that has done too much. The situation in Japan does not provide evidence for the theory that “deflation” (a decreasing price level) is bad. On the contrary, it is the living proof that central bank intervention can mummify and disrupt an economy for an entire generation. That is why I suspect ? contrary to many others ? that Japan will be the first country to be faced with a currency crisis. We can expect a weakening yen and/or rising interest rates in Japan. What will 2015 have in store for Japan? There seems to be a cat-and-mouse game into the making between the recently re-elected president Shinz? Abe and BOJ chairman Haruhiko Koruda. For example, Abe demands that Koruda prints more money to foster economic growth, while Koruda blames Abe for not executing enough measures to save that very same economy. Despite Japan’s failing monetary policy, the Japanese keep adhering to Keynesianism; “stimulating” an economy by printing more and more money and increasing consumptive expenditures. Japan will face an ugly endgame. Pension funds will have to liquidate their bond holdings in large numbers due to the increase in the number of pensioners; it is an open secret that the top executives of the pension sector have already cried out for help. But in 2015, the Japanese will continue to do what they always do: printing money and raising the national debt. Until they finally get into trouble. Is a Gradual and Orderly Unwinding of the Easy Money Policy Possible? As I demonstrated earlier, margin debt (credit that is used to buy stocks) reached records highs (margin debt initially dropped past May, but continued its upward trend thereafter). The current level of margin debts excludes the possibility of a gradual drop in stock prices, because every general fall in stock prices leads to a drop in the value of the collateral. To restore compliance with the collateral requirements, investors have to liquidity some of their stock holdings. He receives a “margin call,” which you might know from a certain movie. Margin debt is a function of the value of the investment portfolio. If the value of the portfolio declines, the investor is forced to sell in order to comply with the margin requirements. Just like in 2007/08 and 2000/01, a “return to normality” will mean heavy and sudden declines of stock indices. When interest rates are raised little by little, this will lead to upheaval in the financial markets. Former Fed chairman Alan Greenspan subscribes to this conclusion. Keep an eager eye on the Federal Reserve balance sheet his year. It may give you a loud and clear signal about the turning point in the market. The turning point at which the stock market crashes, the economy gets into trouble and gold becomes the stock market’s favorite once more.